TL;DR: It's excellent! You should make every possible effort to play it! 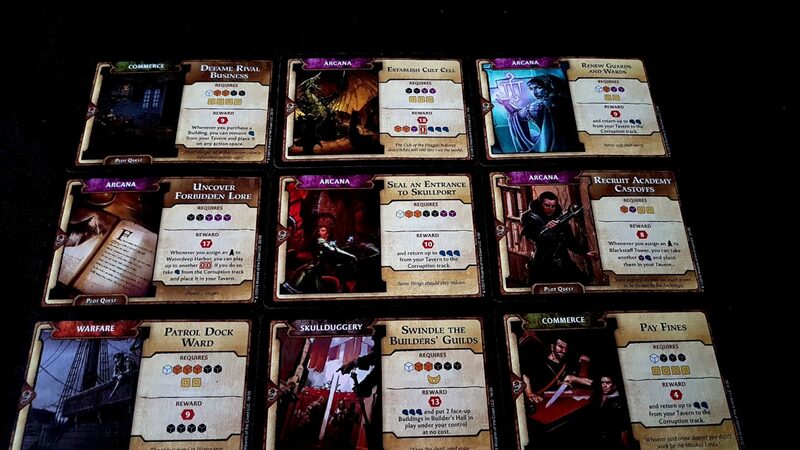 Scoundrels of Skullport is an expansion to Lords of Waterdeep and requires the base game to play. 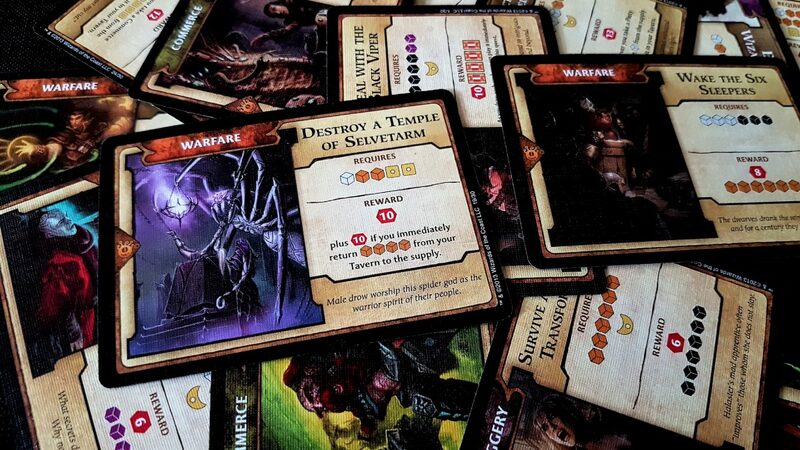 When we reviewed Lords of Waterdeep we said it was a great game that suffered from its somewhat bland mechanics. Fundamentally all the game systems cohered around a simple economic exchange – do a thing and get some cubes/victory points/money. For all the allusions to the great city itself in the end you were essentially moving cubes around a soulless fantasy spreadsheet. We bemoaned the game’s fundamental symmetry, saying that it was if anything too balanced and that something of value was lost as a result. So, let’s talk about its expansion – Scoundrels of Skullport. Scoundrels of Skullport gives us good cause to return to the city of Waterdeep and explore its murky depths once more. It does this by providing us with two expansion modules that we can mix in to the base-game. They’re independent additions so you can play with one, both, or neither – in the latter case though, it does raise the question as to why you bought the expansion in the first place. The first expansion module is the Undermountain – an ancient dungeon filled with treasures, and temples, and glistening jewels. It’s the Forgotten Realms equivalent of Woodstock – a place that everyone of a certain vintage claims to have attended. In Lords of Waterdeep, it’s represented by a secondary map that is placed a little to the side of the main board. It provides three new locations for your agents to plunder. I know – bleak! Here it is – this legendary place of mystery and magic, and it’s just an extension of the cubic alchemy of the main board. You go to a room, you get a thing. They’re not even interesting things! They’re things the main map already gives you – what a disappointment. Hold on, wait – just… shh! Let’s not be too hasty. It’s true that it doesn’t exactly inspire us here, but look at what those rooms do. One gives you a cube of your own choice or two red and black cubes. Okay, that’s underwhelming. 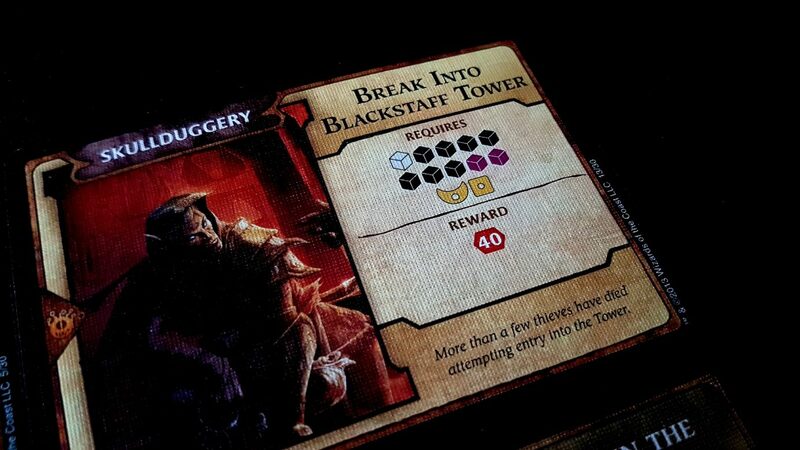 One lets you play an intrigue card and get a quest, which is fine. But look at what the other one does – it gives you two intrigue cards. 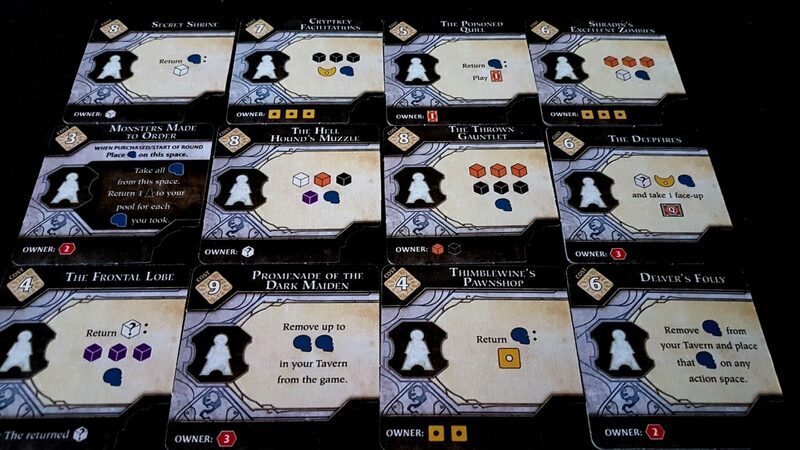 The intrigue economy in Waterdeep was always tight – two fixed spaces on the board would give you an intrigue card, and Undermountain lets you grab two at a time. It doesn’t look like much, but this sets the tone of the real accomplishment of this module – it makes every other part of the game more interesting. If there’s a theme associated with Undermountain, it’s bigger and better. There’s a reason this box comes with special tokens representing five adventurers at a time – this module turns all of the dials on Lords of Waterdeep up to eleven and then it strikes a pretentious power-chord while holding a guitar aloft. Both of these modules come with new decks of quest and intrigue cards, and these are the heart of the expansion. Much of what you did in the base game wasn’t very interesting – throw in some cubes, get a few victory points. Nothing felt like it was particularly meaningful – you were looking for macroeconomic efficiency rather than short term tactical advantage. Your Lord was in charge of a slaughterhouse that turned raw cubes into delicious, processed points. The only real lever you had over success was how efficiently you could streamline the process. Well, not any more. 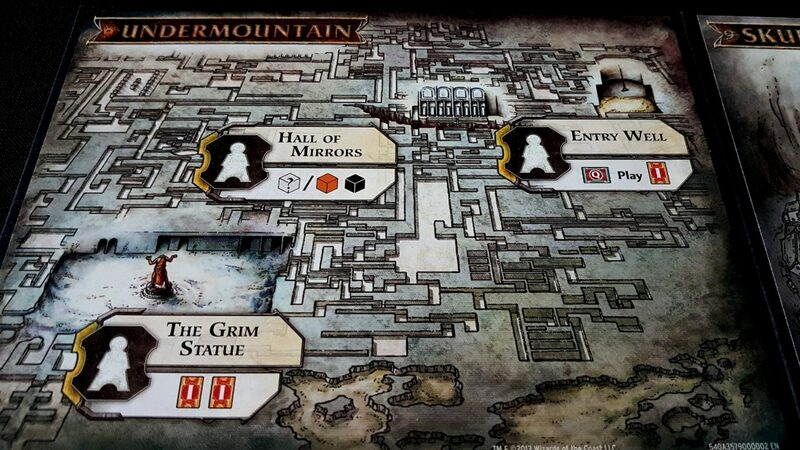 What Undermountain does is make the quests you do interesting for more than their point values – there are many more plot quests with ongoing effect, but the rewards that you get from even normal quests require more thoughtful consideration. The costs of these quests too are sometimes massive, and come with correspondingly impressive returns. There are forty point quests in this deck, and they’re the least interesting ones it has to offer us. Some quests give you different kinds of cubes in return, which is surprisingly interesting as a mechanic. Waterdeep has always been about the cube economy and the scarcity of certain colours moderated by the availability of special buildings. Now, there are quests that unbalance the delicate machinery of the city, and their value is tightly coupled to the machinations of the Lords around the table. It’s very neat. Look at Defend the Lanceboard Room, up in the top left. It requires an eye-watering number of resources, but will give 12 victory points and eight adventurers of your choice as a reward! Or look at Threaten the Builders’ Guilds down in the bottom left. Another eye-watering outlay, but look at the comically powerful reward you get – every building in Builder’s Hall becomes yours. There are reasons now to pick a quest over another one, other than ‘well, this one counts for slightly more because of my Lord bonus’. Sometimes the resources you put into a quest even modify the rewards. You can spend time thinking about what quests mean, short and long term. That adds a lot to play. Survive that meeting and you’ll get plenty out of it. But not only is Undermountain more interesting, it’s also more mean-spirited. 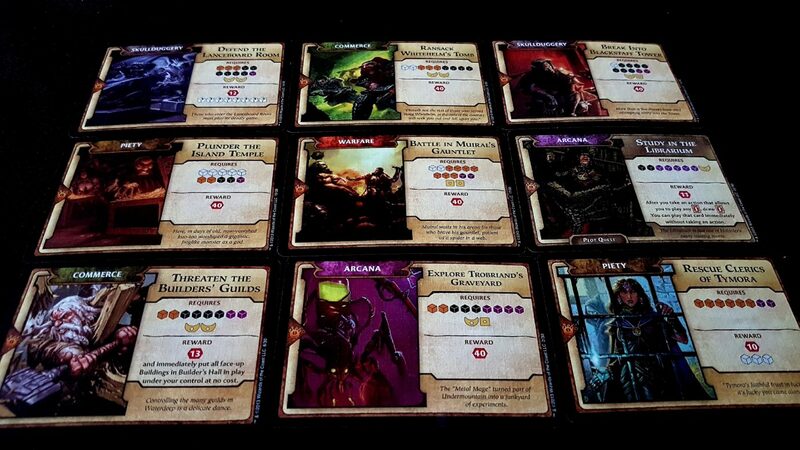 The intrigue cards that come with this module add in direct, pointed competition in a way the base game didn’t. The base game, short of mandatory quests, was all ‘I get a good thing, and someone else gets a less good thing’. Here, intrigue includes direct theft, forcing someone to reveal their Lord, or destroying buildings. 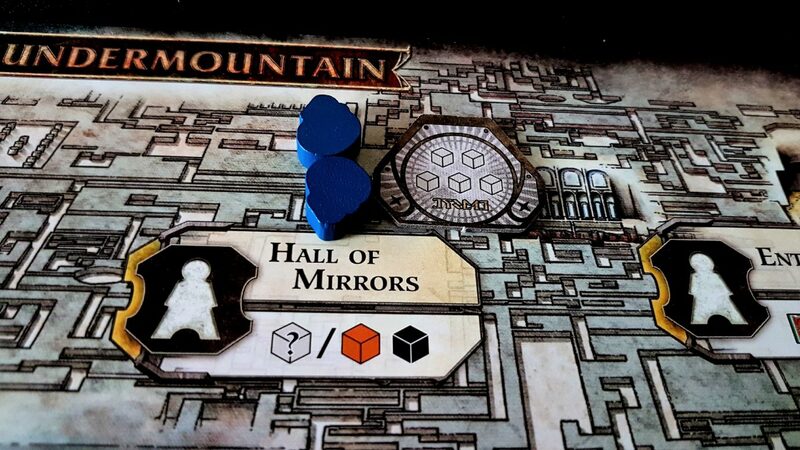 That, coupled to the fact that Undermountain and the buildings it provides ensures intrigue cards are easier to get and play leads to a more directly aggressive experience. You no longer feel like you’re engaged in a lonely act of civic onanism. And then the buildings – they conform to the basic theme of ‘bigger is better’ but also introduce a new mechanic that gives you the ability to temporarily alter the balance of value in the city. Some permit you to place resources from the supply onto action spaces, ready for the next person to claim. If you need to sweeten the pot to seduce someone away from a building you need next, you can do it. If you want to lay them around your own establishments to direct people towards your welcoming hospitality you can do that too. Sometimes you can even set up beautiful long-cons, trying to mislead people into thinking you’re leading them somewhere for nefarious purposes only to scoop the accumulated rewards for yourself. It’s yet another layer of direct player interaction in a game that was somewhat lacking in that area. Even the three new lords you get are interesting, because they stress the asymmetry that I felt was missing from the base set. It would have been good to see more of them, but that’s a very minor complaint. 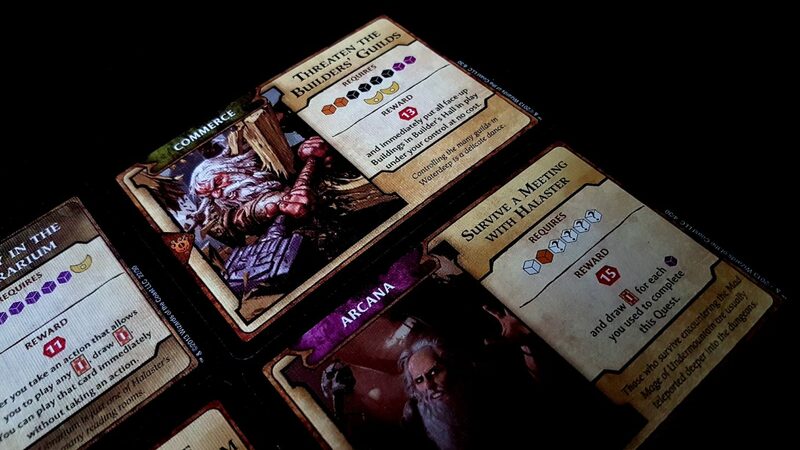 Like Undermountain, it’s marked by a noticeable increase in the quality of game design in its quest and intrigue cards, offering more thought-provoking strategies. Where Undermountain does this with scale though, Skullport does it with subtlety – through this beautiful corruption system that is the heart of its decks. Corruption in Skullport is a kind of ‘anti-victory point’ – they’re penalties that get docked from your score at the end of the game. That’s straightforward enough, but what makes this system so good is that the weight of the penalty is directly related to how much corruption is left on the track. The track too is a communal resource. The first corruption token costs a single point. The next three cost two. The next three after that cost three each, and so on. But that’s not a cost that you pay upfront – as more corruption tokens are taken from the track, the penalty for every token in the game increases. You might find that single point of corruption you took early on costs you eight victory points in the end. Yeesh. 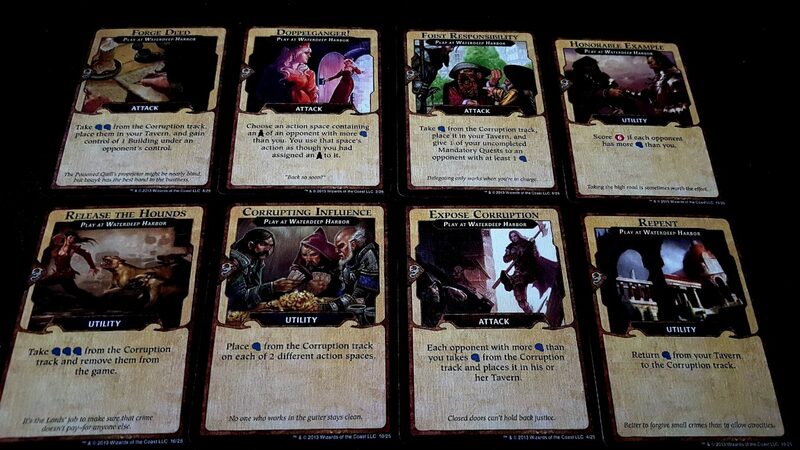 You pick up corruption like you do any other token – through quests, intrigue and building actions. Some buildings have corruption listed along with the rewards. So, why wouldn’t you just avoid those buildings? That’s easy – the rewards are very good indeed. 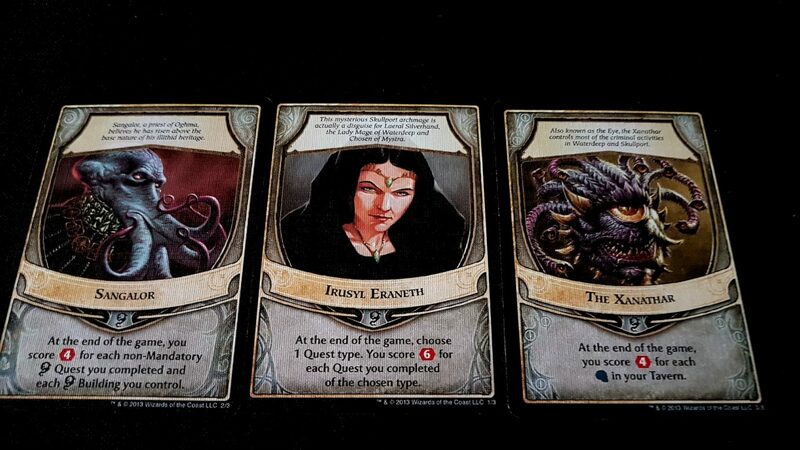 Look at the Hall of the Voice – a quest card, an intrigue card, and five gold. Yowsers. Look at Slavers Market – four adventurers, for a point of corruption? That’s a bargain at any exchange rate. You could go to Skull Island and pick up two wizards or two priests if you like. Wizards or priests you could use to complete a quest that would reward you far more than any corruption penalty could be worth. That’s how it begins – with the cost-benefit proposition being gently warped by the presence of these ever-shifting penalties. That’s nice, but it’s hardly earth shattering. After all, all you need to do is make sure that your enemy has more corruption than you do and it’s all a wash in the end. But that simple observation is what elevates corruption into a phenomenal mechanic. Skullport doesn’t just introduce the track. It also introduces a whole mess of tools for managing your own corruption and taking advantage of the corruption your opponents have accumulated. Look at the Skullport quests – some of these whisper sensuously that for just a little investment of effort they’ll reward you handsomely. Too handsomely, for the outlay. Come on, look at Establish Cult Cell – you put in four adventures and three gold. 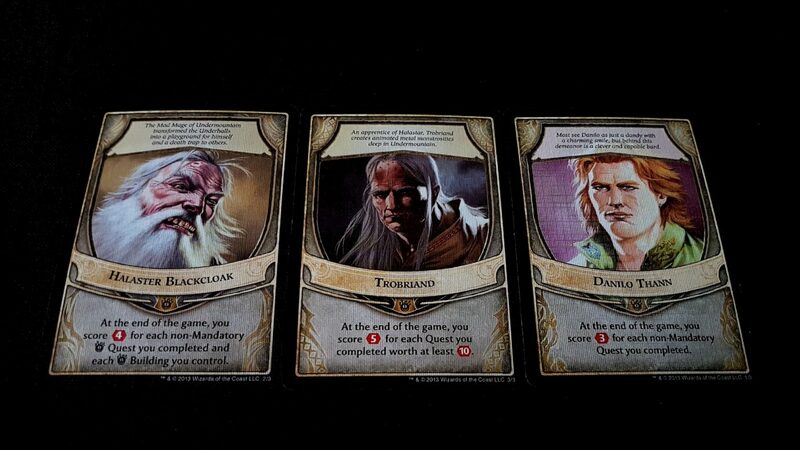 You’ll get three adventurers right back, and an intrigue card, and eighteen victory points. What, three corruption tokens? Look at the track – that’s only six points of a penalty. You’re still twelve points ahead on the deal. Come on, it’ll be fine. Just do it. Juusssssst dooooo iiiittttt…. 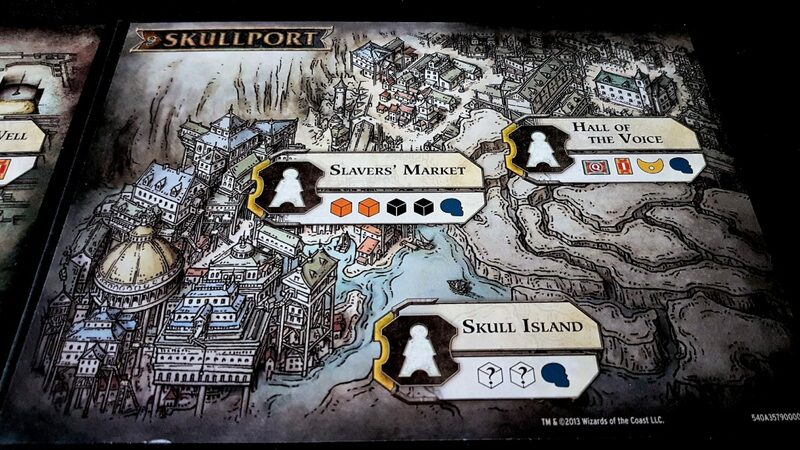 But then look at Seal An Entrance to Skullport – it’s much more costly, rewards you less, but lets you return three of your corruption tokens to the supply. Suddenly corruption becomes something like a payday loan – hugely punitive, but maybe a seductive option that you could temporarily leverage to accomplish your short-term goals. The problem is that opportunities to pay back corruption are limited, and you’ll all be looking to take advantage of them as often as you can. Who’s getting screwed, and how hard? Oh my, and corruption gets more interesting still. If you are less corrupt than an opponent, you get opportunities to leverage their poor reputation against them. Or you can seed action spaces with corruption if you think it serves your purposes – maybe you want to keep a particularly plum resource for yourself, or perhaps you want to poison the well for everyone. That’s all fair game here. Spend a few rounds seeding corruption around Castle Waterdeep and maybe you can keep that first player token for the rest of the game. 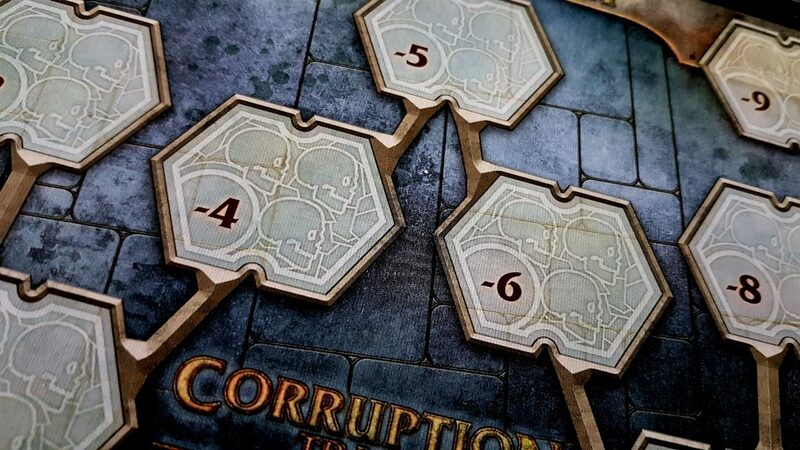 But the really interesting opportunity here is in the Release the Hounds card – here, you take three corruption tokens from the track and simply remove them from the game. Boom – you have just made corruption permanently more costly for everyone, and there’s no way to row back from it. If you’re the one with the least corruption, you basically just levied a ‘dickhead tax’ on everyone that’s been up to no good in the city of Waterdeep. Virtue is its own reward, and a wise Lord is wary of accumulating too much corruption. Look at Monsters Made to Order – when you grab all the accumulated corruption from there you get to reassign one agent per token. If you picked up six tokens, you basically get a free round. 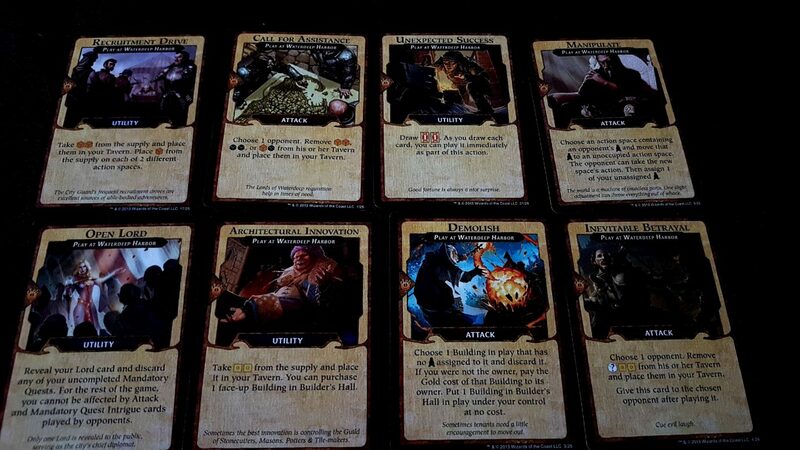 Six unobstructed turns to advance your agenda in Waterdeep. Isn’t that worth six tokens? It almost certainly is, right? Or what about the Cryptkey Facilitations – three rogues and five gold, for a single corruption? You’d be mad not to take advantage of that. And anyway – look at the Delver’s Folly and the Promenade of the Dark Maiden. You’ve got tools for managing your corruption, if they appear in the city at some point. Corruption takes Waterdeep’s staid mechanics of risk and reward and spins them on a roulette wheel. Every single turn, of every single round, the value proposition of everything changes. The over-reliance on symmetrical gameplay that marred the base set is fixed completely without requiring anyone to learn anything new – corruption is just a new kind of resource you pick up, just like all the others. It’s very, very clever – it makes the game meaningfully more interesting without adding anything significant in terms of complexity. The rules for corruption you’ll pick up almost instantly – the impact it has on gameplay takes a lot longer to appreciate. 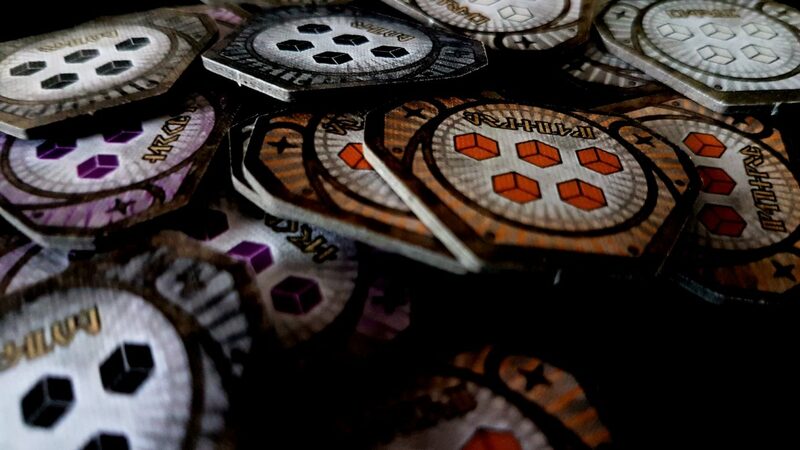 And not only that, the game also comes with the components for a sixth player, and extra agents for all the existing factions. Playing with either (or both) of the modules benefits from a little extra flexibility of agenda and for that you’ll need additional agents within the city. And you get them. Everything has been tweaked here to make for a thoroughly satisfying addition to an already enjoyable game. Before we get to the glowing recommendation though, a few words of warning. While corruption doesn’t add much to the game’s complexity, the first few times a player encounters it will throw off their internal calibrations. Previously solid play-styles cease to be viable, and while there are opportunities to discard corruption they’re shared between everyone. It’s easy to end up in a position where you leave yourself open to retribution as others manipulate the corruption track to your detriment. The design of both expansions too results in players having more opportunities to screw with each other, and more ways in which they can do it. Both expansions radically loosen up the intrigue system, and encourage players to take deeper advantage of it. That leads to a game that, even without a change in player mindset, ends up being more directly confrontational. People will adapt, but this isn’t an expansion that just gives you more of the same. It meaningfully alters the experience of play – it won’t always be for the better, for everyone. 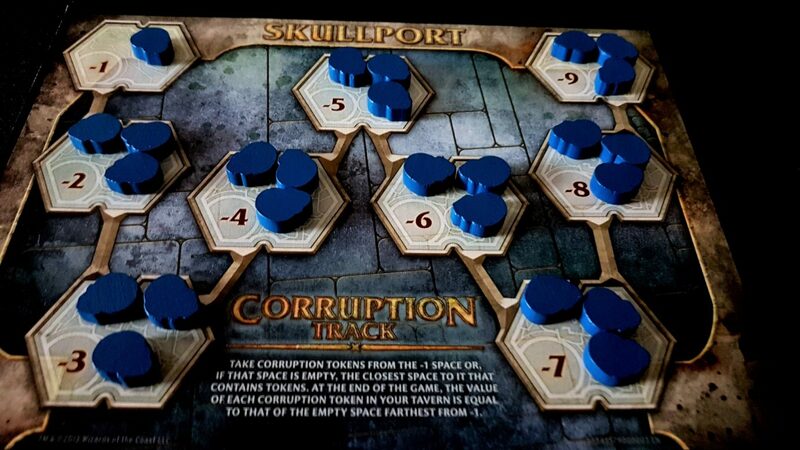 For me though, Scoundrels of Skullport takes a solid eight out of ten game and makes it a nine. While I’d still enjoy the base game without the expansion modules, I can’t see myself ever choosing to play without them. They just unlock so much fun in game that often felt curiously disconnected. It’s like the cliché eighties trope, where the stuffy librarian would unpin her hair, take off her glasses, and loosen up a little. ‘My God’, the gormless protagonist would say, ‘You’re beautiful’. 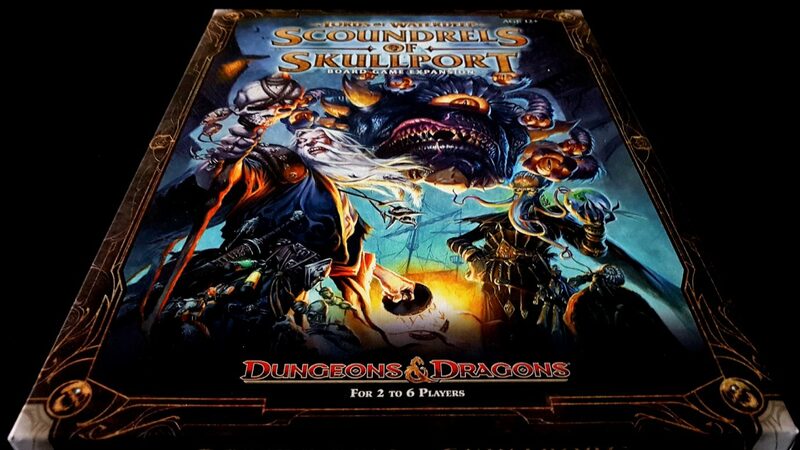 In my view, Scoundrels of Skullport is a must-buy expansion. We spend many hours a week investigating the accessibility of board games. What we do is unique. It's a job that needs to be done but we need your help to make sure we can keep on doing it. If you believe board game accessibility is important and can support our Patreon you'd be helping make sure the site can continue with this valuable work. Special thanks to our backers at the $5 and above level! Here are some of our more lighthearted things to show we're not all about the Serious Business of games. We make use of Amazon affiliation links in many of our posts. These are usually set the first and last mentions of the game being reviewed. We make a small commission from every sale generated as a result of you using those links. Copyright © 2019 Meeple Like Us. All Rights Reserved. The Matheson Theme by bavotasan.com.